Last year, IBM research scientist Patrick Bohrer released the Mobile Systems Remote on Apple’s App Store. Now, the app – a remote that lets IT administrators manage IBMBladeCenter or System x server – is available for Android OS devices. The following interview with Bohrer, a newly named IBMDistinguished Engineer, discusses the remote’s new features, ideas for future mobile projects, and a look back at his work on the processors that made their way into Nintendo, Sony and Microsoft videogame consoles. Have you made any updates or added other features to the IBM Mobile Systems Remote app now that it’s available for Android? PB: We released version 1.0 of IBMMobile Systems Remote on Apple’s App Store to get customer feedback. One of the main responses we got back from customers was the desire for an Android version. So, the team created one for Android that matches the v1.0 functionality found in the iOS app. Moving forward we plan to release updates to both versions to meet additional requests for new functionality. Managing servers is complicated (certainly compared to say, playing a videogame on a mobile device). How did you plan out the navigation of the app? Were there functions of a server that didn’t make it into the app? PB: Managing servers through legacy management interfaces is hard. But we’ve learned quite a bit over the past couple years. We wanted to create an app that could talk to our servers without requiring new support in our management interfaces. Towards this end, we built an app framework consisting of a local data model and multiple management interface modules that communicate with IBM products and services. This structure allows us to add support for legacy IBM products already in the field. So, we’re using this platform as an exploratory vehicle to create rich, highly consumable, customer-centric views of our products and services. The navigation and views found in the app are the result of direct feedback from IBM’s human factors teams, along with feedback from a number of user studies led by these teams. This input has been invaluable in deciding where we should focus our time. Our wider releases on these app stores is an attempt to get even more feedback from an even broader audience. As a newly named Distinguished Engineer (IBM‘s second highest technical ranking, behind only “Fellow”), where do you want to take IBM‘s development and use of mobile technology? Any predictions for where “mobile for the enterprise” will be in five years? PB: It is certainly an honor to be named an IBM Distinguished Engineer. IBM has a wealth of talent, expertise and capability across all of its organizations. With our mobile work, I plan to find ways to bring these technical capabilities out in our interfaces to not only differentiate IBM products, but bring to light the wealth of information that often lies untapped within them. Mobile has changed the expectations of users and in doing so has changed the structure of applications themselves. We all want immediate access to our information with a continuous user interface across our phones, tablets, desktops and even TVs. cloud, middleware and mobile platforms. I plan to find new, creative and meaningful ways to use IBM‘s solutions in this space. Speaking of games, you have worked on IBM‘s microprocessor technology used in Sony’s, Microsoft’s, and Nintendo’s game consoles. What was it like to work on these projects? PB: This was another exciting time to be an IBMer. And it was also probably the first time my kids actually wanted to better understand what I did at work. The research project I was leading at the time was a simulator of future IBMsystems capable of running complete operating systems and applications on models of hardware that didn’t exist yet. Our simulator was used to model all three of the game chips being developed at that time. We were most-involved with the Sony-Toshiba-IBMCell design center in Austin. Working with these teams as they designed the Cell chip; modeling early ideas; running prototype software; and then giving feedback to these teams was a great experience. It is always an exciting time to be involved in a project where IBM and its partners are flexing their muscles. Having the opportunity to work with these types of teams and respond to these kinds of challenges is the reason I’m an IBMer. 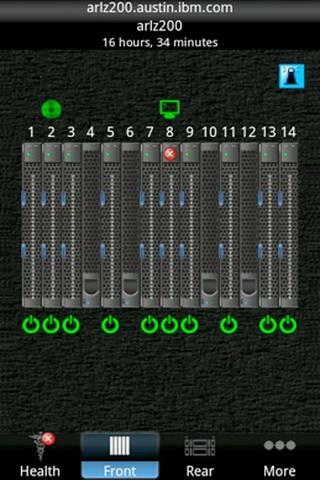 Check out the Android version of IBMMobile Systems Remote on Google Play. For the iPhone, visit the Apple App Store. Is the Internet reaching its limit?